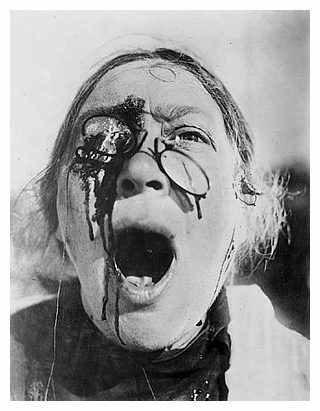 Upon seeing Sergei Eisenstein’s Odessa Steps sequence from his seminal film The Battleship Potempkin and studying his essay in the book, Film Form, titled, “A Dialectic Approach to Film Form,” I arrived at a place of criticism of Eisenstein’s theory of montage. 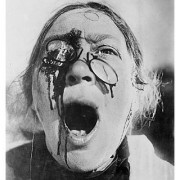 In Film Form, Eisenstein addresses the “political” implications of film and its potential for ideological proselytizing: “I would not attempt to deny that this form (film) is most suitable for the expression of ideological pointed theses, but it is a pity that the critics completely overlooked the purely filmic potentialities of this approach.” This statement strikes me as important to understanding both Eisenstein’s film work and his theoretical elaborations. Not only did he use film as a propaganda tool, he took the Soviet ideological apparatus and applied it to the theoretic underpinnings of filmic language. Eisenstein’s application of the dialectical “method” betrays an immaturity with regard to Hegelian/Marxist thought. The Soviet experiment made a critical mistake of attempting to take Marx and Engel’s writings and develop a working model for a society. This was essentially counter-revolutionary and a general frustration of the dialectical process of unfolding understood by Hegel and Marx. This is the crux of the issue (of applied dialectics or a programmatic realization of contradiction as the defining motor of change)that Eisenstein demonstrates is a limited understanding of the dialectical process: an unfolding of elements as a result of social pressures. Eisenstein’s use and misuse of dialectical reasoning, inspired me. He sought to employ dialectics in the realm of film and theory and I am not convinced the dialectic functions as a utility. I believe the shortcomings of this forced application betray an immature, and programmatic method that reflects Soviet Communist ideology. This misunderstanding is/was clearly manifest in the Soviet model of ‘actually existing socialism” which did a very anti-dialectical intervention into its own historical process by developing a state controlled means of production and an ideological apparatus whose most sophisticated function was survival. Ideological survival included, among other functions, the demonizing of capitalist process and its participants and an “imperialism of the people” in its implementation of the Soviet model on countries and regions to the periphery of Russia. 1) The adoption of the conflict method of montage which transforms two side by side shots into a third action or dynamic. 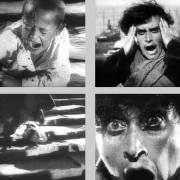 Eisenstein uses the idea of conflict as the motivating concept of dynamism in filmic montage. Two seemingly unrelated subjects create a dialectic third through their placement next to each other in montage editing and temporal space. 2) Film Form as treatment or theory of dialectic imprinting on the “brain” that may yield dialectic thinking. 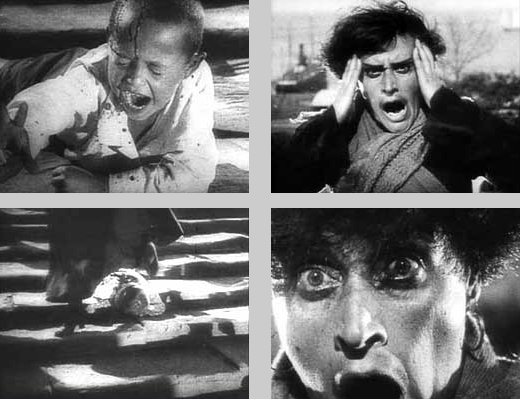 Eisenstein elaborates this idea through various descriptions of conflict development in montage. (For example, graphic conflict, conflict of planes, conflict of volumes, etc.) The chief use of this conflict juxtaposition is to deliver a visual representation of the dialectic process, thereby influencing our way of thinking about the film, and hence, the world. The dialectical dynamic is bandied about by many intellectuals and academicians and frequently lacks definition or qualification. Dialectics are as misunderstood as Marx/Engel’s ideas about socialism and the assumption by many that they were the architects of the socialist experiments in the world. The sheer magnitude of their work dealt completely with the illustration of the process of capitalist reproduction of social conditions that would be the systems undoing with the birth of the next stage of class relations to the means of production: socialism. Marx stated after the crushing to the Paris Commune in 1871, that socialism could only be defined by experimenting with what socialism could be: to explain what socialism is without practical application is Utopian. Primary to Marx/Engel’s interpretation and development of dialectic materialism was their idea of contradiction: the incompatible development of elements within the same relation. For instance in capitalist society, the capitalist class and the working class develop unique properties in relation to the means of production. The capitalist class consolidates its wealth and control by ownership of the means of production while the working class toils away and sells their labor power as a commodity. The capitalist class becomes wealthy and powerful through the exploitation and oppression (oppression through the dehumanization of the worker in the process of labor, repetition of task, the selling of one’s labor power to the highest bidder) of the working class. This is the fundamental contradiction of capitalist society. One cannot understand the Marx/Engel’s dialectical materialism without going back to Hegel. Hegel’s whole gig was to create a synthetic reason in response to a negative criticism and reductionism derived from Socratic dialectics. Socratic dialectics, Hegel challenged, offered no alternative to its destructive, deductive process of tearing down and definition of what was not. Hegel developed a modern dialectic that he explained as a mature/forgiving philosophy based on synthesis vs. the immature/angry dialectic of Socrates. Hegel’s main illustration of contradiction was the master and slave relationship. Within this relationship, the contradictory impulses of both the master (to dominate, to receive validation through control) and the slave (desiring freedom; learning that oppression is not the way to achieve it). Hegel saw that emancipation was a probable revolutionary outcome from the opposing forces in the master/slave relationship. Although these ideas that Eisenstein has worked on are rigorous, they neglect fundamentals of dialectical materialism and Hegelian dialectics as a “process” of becoming in the external world (instead they are a applied treatment or universal description of specific form) and a way of apprehending this process in our thinking. The Dialectic is a global current, a supreme law of change. Within this current exists a multitude of waveforms that interact in a common substance (such as water, in this metaphor). The constant dynamic interaction and friction between waveforms yields ever larger and radical manifestations, through reverberation and additive cooperation. The ever-increasing scale and quality of these larger waveforms result in powerful forces that exert their influence, transforming fundamental elements into ever changing manifestations. This is my understanding of the dialectic process. It is not something that I can apply; rather it is an internalized dynamic, a thought process, and an external unfolding of change that manifests in all creations, especially social conflict, in this example. Through a study of wholeness, the perception of the larger environment of our thinking and of the world’s action (in the social sense) becomes truly dynamic.The Dialectic is a process; it is not a methodology from which to work nor is it and application to employ. Eisenstein, Sergei. “A Dialectic Approach to Film Form” Film Form, Ed. Jay Leyda(Harcourt Brace & Company:Florida, 1947) 62. This entry was posted in Uncategorized by DaveTinman. Bookmark the permalink.